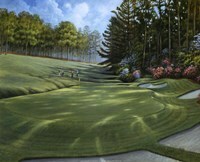 This colorful and life like print is of the putting green on the 12th hole at the famous golf course in Augusta, Georgia. The grass is emerald green and manicured to perfection. 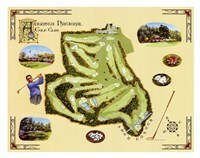 There are three sand bunkers, two north of the green and one south of it along a small brook that dissects the course. A small quaint arched pedestrian bridge provides access to the other side of the stream. Spring is evident in the gorgeous flowering trees and shrubs on the edge of the course. There are white, pink, red, purple and orange blooms creating a kaleidoscope of colors. The vegetation is lush with numerous trees, making the spot very private. There are two golfers on the edge of the green, one dressed all in white and the other has a red top and blue pants. A golf bag stands upright not far from the men and a yellow flag marks the hole. Charles White has captured nature’s beauty with a sense of tranquility and serenity in this piece and is typical of his style. Each of his paintings is classically crafted with attention to the principles of design, color and contrast. His technique creates luminous, multi-layered work that draws the viewer into the world of beauty and elegance.